Padauk, maple, Purple Heart, maple inlayed stars. 12 1/2” x 22” x 1”. 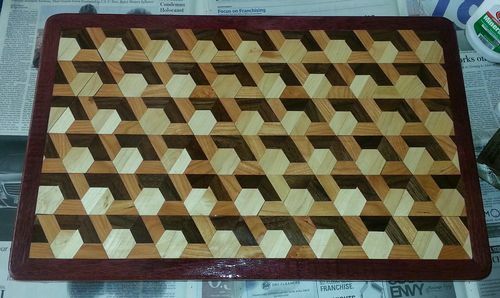 Cutting board/serving tray. No paint or dyes. Star field cut with CNC machine, reverse cut stars for inlay. Titebond III waterproof glue. Finish, food-grade mineral oil. Fabulous work, but as a vet, I’m not sure it’s an appropriate theme. Dale, I’m curious. 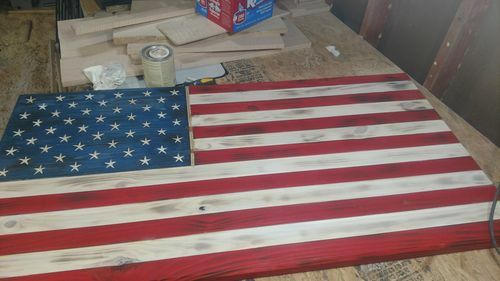 Why, as a vet, do you feel making an American flag cutting board is inappropriate? Assuming when you say vet you mean you are a military veteran, not an animal doctor. As reference, I am a retired Lt.Col USMC, with two sons currently serving in the Marines. Love the flag theme. I never thought about making a flag into one. I’m a retired Army Grunt myself and find it totally appropriate. I think Dale is referring to the fact that you will be getting the flag dirty and cutting it up. I make flags from wood myself and I guess some may find it inappropriate to use one as a cutting board. Wseand, Love your flag as well. My flag cutting board does not have stars on the back side so if someone actually did want to cut on it they wouldn’t be cutting on the flag. 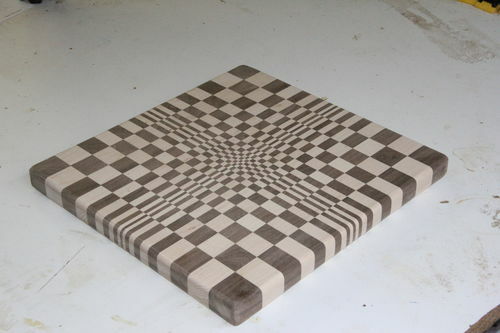 Actually, I call my cutting boards “non-cutting boards” since most people don’t cut on them, though they could, anyway. People I’ve sold the flag boards to prefer to use them as a table center piece on holidays. Those are some nice boards. That’s the problem no one wants to use them.